In Mexico, Cinco de Mayo is primarily observed in the state of Puebla, where in 1862, the Mexican army was victorious over the French at the Battle of Puebla during the Franco-Mexican War. However, in the United States, Cinco de Mayo has become extremely popular, especially in areas that are heavily populated with those who are of Mexican-American descent. Many people celebrate with parades, parties, mariachi music, dancing, and traditional food and drinks such as tacos and tequila. 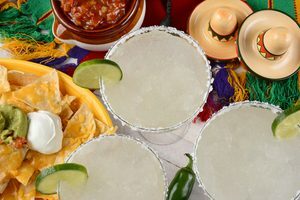 This Cinco de Mayo, if you’re looking to sip on a margarita, check out these spots known for the best-tasting margaritas in Orlando. Margaritaville – This national chain owned by singer Jimmy Buffet is popular with tourists and locals alike. Located in Universal City Walk, there are plenty of unique margarita options. Can’t decide? Try the margarita flight, which lets you sample several favorites including Who’s to Blame®, Wildberry, Watermelon, and Mango. Cocina 214 – A contemporary Mexican and Tex-Mex kitchen that combines bold flavors with fresh, local ingredients. Their cocktail menu features 16 margaritas, including one that has Pop Rocks around the rim. Sample their creative concoctions at 151 E. Welbourne Avenue, Winter Park, Florida 32789. Rocco’s Tacos – How do you know that a restaurant takes Cinco de Mayo seriously? They have a countdown to Cinco clock on their website. Order a margarita with their housemade sour mix and accompany it with their famous tableside guacamole. With 425 varieties of tequila you can sample, you’ll definitely want to take a siesta back at our hotel. Visit them at 7468 W Sandlake Drive, Orlando, Florida 32819. Antojitos – Another favorite stop in Universal City Walk. If you’re looking for something other than your typical house margarita, try the Blood Orange, made with El Charro Blanco tequila, Patron Citronage, blood orange, and fresh lime. Agave Azul – In addition to serving tasty Mexican food, Agave Azul also has delicious margaritas. The restaurant opened in 2008 and has been doing well ever since. Try the Chia Margarita or the Organic Margarita. You can find them at 4750 S Kirkman Rd, Orlando, Florida 32811. These are just a few of the Orlando restaurants that offer margaritas sure to quench the thirst of anyone looking for a traditional Cinco de Mayo cocktail. When booking your trip, be sure to stay at a hotel that puts you near all of the great food and drinks the city has to offer. (Of course, we hope you’ll enjoy this holiday responsibly.) For room availability and to book your stay, call us at 407-996-1600.